Nuclear medicine imaging is key in the initial diagnostic workup and used for staging and restaging. Also it forms basis for planning of therapy targeting somatostatin receptors, either as somatostatin analogues or peptide receptor radionuclide therapy (PRRT). 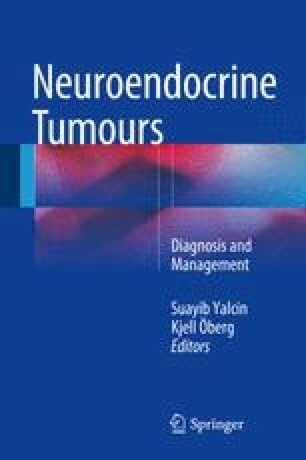 For decades somatostatin receptor scintigraphy has successfully been performed using gamma camera technique and SPECT with the tracer 111In-DTPA-octreotide. Recently, several positron emission tomography (PET) tracers targeting the somatostatin receptors have been introduced. The most commonly used of these are 68Ga-DOTATATE, 68Ga-DOTATOC, and 68Ga-DOTANOC. They all perform superior to SPECT and should replace gamma camera tracers whenever possible. With FDG-PET it is possible to detect a large proportion of the somatostatin receptor-negative cases, and FDG-PET therefore seems to be a valuable addition. Furthermore, FDG-PET has prognostic information that potentially may be used in selection of therapy. With the abovementioned PET tracers available, the need for 123I-MIBG, 18F-DOPA, and 11C-5-HTP may be limited.